Hello, 2017! 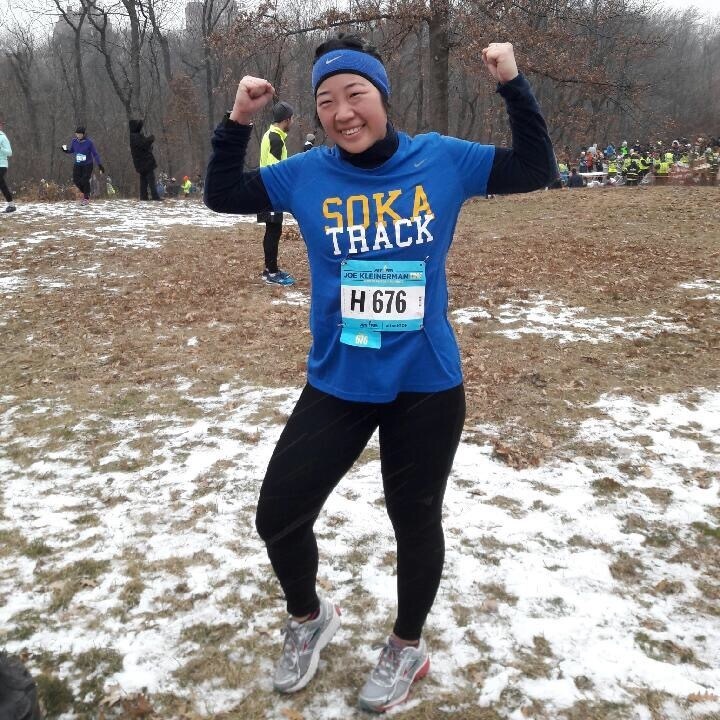 This morning on Saturday, January 7th, I braved the cold and completed the NYRR Joe Kleinerman 10K 2017, my first race of the year. I’m thrilled to be starting off the year strong (in sub-freezing temperatures!) and am determined to keep making progress. 2017 is going to be big. I’m entered in the United Airlines NYC Half (Manhattan Half) in March and qualified for the TCS New York City Marathon in November and I’m going to obliterate them. To kick off the new year, I’m sharing my running goals for the upcoming year. I don’t ever want to lose the sense of love I have for running. In all honesty, though, maintaining that on a day-to-day basis is truly a challenge. I struggle to get up and run. Every day, I wake up sore and tired. The cold weather now in New York City isn’t helping. Racing makes it easier since I have something to work towards but it’s still hard not to make excuses. This year, I want to overcome that mental barrier and to always be able to love running for what it is. I derive so much joy from having a body that can continue to do incredible things and running is how I express that appreciation. Running and finishing the New York City marathon has been a big goal of mine. Since starting Cross Country as an undergraduate student ten years ago, I knew that one day I would run the marathon in my own city. I’m qualified and it’s ten months away and I can’t believe it’s happening. I’m still trying to wrap my mind around how I’m going to run 26.2 miles but all I can do now is focus on my training. Finishing the marathon is priority but I also want to challenge myself to a 9-minute mile pace throughout the entire thing, putting me at under four hours. Let’s get this done! This year, I’m going to run all the races in the 5-borough series. Each race in the series is a representation of what make the boroughs special and allows runners to celebrate being part of a diverse and unique community within this remarkable city. I’m kicking off the 5-borough series with the United Airlines NYC Half in March and then the Airbnb Brooklyn Half in May, the NYRR Queens 10K in June, the New Balance Bronx 10 Mile in September and the NYRR Staten Island Half again in October (because running it last year through harsh weather conditions wasn’t enough). My 9+1 journey last year was an incredibly fulfilling process. Starting out alone was tough but maintaining the drive to keep going was quite the struggle. What really got me through was being able to meet and connect with other runners in the same position as myself. That reason alone motivates me to do 9+1 again and obtain my marathon qualifier for next year. The New York City Marathon is something I intend to do as long as my legs are in place and my body doesn’t fail me. I’m looking forward who I’ll get to meet and how much more I’ll grow as a runner in the upcoming year. When I started this whole thing last June, I never expected to love the process and remain hungry for more even after completing my ninth qualifier race. That wasn’t enough so I ended up running three more races and added an extra volunteer shift, totaling to a 12+2. If I’m starting my running endeavors from January, then I need to do even more this year. I want to prove myself that I’m much more capable than I give myself credit for. And I’m not able to settle for accomplishing the bare minimum. My goal is to run a total of 20 races, including each race from the 5-borough series and the marathon itself. The only reason why I set this particular goal for myself was to make sure I got through today’s race. It is the only race I’m running in January and I wanted to be sure that I’d get it done, regardless of the weather conditions. When I signed up, I never imagined it would be 22 degrees with powerful winds pushing snow in my face. It was brutal but I crushed it. On top of that, I managed to improve my distance mile time by 30 seconds and breaking my 9 minutes per mile pace as I wanted. New Year means a new personal record! And I’ll be sure to complete a race in every month this year. I’m not terrible when it comes to taking care of my body but I definitely need to get better about it. There were many things I neglected in the process such as quality warm-ups and cool downs, dynamic stretching, foam rolling, hydrating, nutrition and form. I haven’t figured out the most efficient way to work out and recover so I want to focus on developing a system for that. As a food lover, I don’t always watch what I eat and that can be quite detrimental to my performance. Finally and most importantly, I need to get in the habit of properly recovering and resting. That’s key to becoming stronger. Steve Prefontaine, my favorite athlete, once said “To give anything less than your best is to sacrifice the gift.” It’s remarkable how much we, as humans, are capable of. Yet, we let the devils in our lives overtake us and we can trick ourselves into accepting complacency. I want to constantly challenge that and commit to giving my best in every moment. Even during a regular workout, I find myself falling down while doing push ups or walking during a run and it pains me because I know I’m better than that. My determination is to push past that and really give my best in every moment. Now that 2017 is here, the pressure is on! Being active is tough as it is but to stay fit toward my goal of running the marathon has been difficult. My environment plants many temptations around me and it’s easier to give in. I have to fight my tired mind, my sore body, my nagging alarm clock and New York City’s cold weather just to say I did it. People ask why I put myself through it all and I don’t really have an answer. My legs hate me every day and I barely have a social life. But running keeps me in a state of mind where anything daunting can be done. I don’t want to be afraid of anything. I don’t want to lose to excuses. I’m going to win every step of the way.